We print on a variety of different shirts and styles. 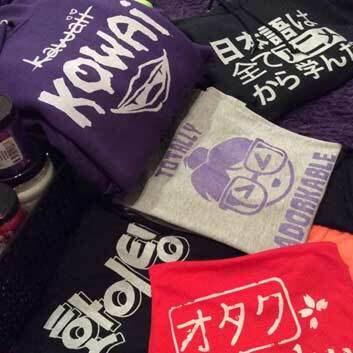 Most of our items will fall under two types of sizing - men's/unisex sizing and ladies juniors sizing. Generally, our ladies sizes run a bit small. Check the size chart under each listing for sizing for that specific product. Width※ 18" 20" 22" 24"
Length 28" 29" 31" 32"
Width※ 26" 28" 30" 32"
※Chest width measurements are measured flat across the front of the shirt. For an all-around measurement, double this number. Our regular t-shirts are men's/unisex cut, made of heavyweight preshrunk cotton. The shirts come in a variety of different colors, and we will gladly customize a shirt to the color of your choice - just send us an email! Chest Width※ 15.5" 16.5" 18" 19.5" 21"
Length 26.5" 26.5" 27" 28" 28.5"
※※Approximate women's US shirt size equivalents. Since brands may vary, be sure to check the measurements as well. Our fitted ladies shirts are super-soft and made from 100% cotton and with a comfortable stretch. They are juniors sizing, and our ladies shirts do run small. We can customize nearly any design we carry, so don't be shy about asking for different colors or styles if you have a particular type of shirt you're looking for. We categorize some of our clothing by gender as a general guide for the type of size and fit to expect. However, we firmly believe that "clothes are for people", not genders, and that all people should wear what makes them happy! All of our t-shirts are screenprinted by hand and sent directly from us to you. We use non-toxic, water-based inks, meaning the print soaks into the shirt leaving it as soft as the fabric, and the design won't ever peel off like an iron-on or plastic-y transfer. This also gives some of our prints on darker colors a "distressed" look.